Earlier this week Sam turned 18. I mean “wow”…where did the years go? It was like yesterday that I was holding her as a newborn, and now this? Sam was born on Super Bowl Sunday – Jan 28, 2001. It all started to unfold after an afternoon walk as we prepared for a Super Bowl party at home. My ex said that she’d started having contractions and that they were definitely getting closer together, so with that, we grabbed the pre-packed bag and left her parents and Zach to watch the game as we left for Women’s College Hospital in downtown Toronto. We arrived onto the maternity floor around 6:15 pm, not long before kickoff and there wasn’t a soul to be found… nope, they were all huddled around the television watching the pre-game show in an adjacent room just down the hall from the nurses station. Eerily quiet! The skeptical nurse began asking my ex some questions about the amount of time between contractions etc, when a powerful one hit, and her knees buckled. The nurse was able to quickly grab a nearby wheelchair as I held her before placing her carefully into the chair, next stop the birthing room. The contractions were on a steady rhythm and so after a quick observation paged the on call Doctor who arrived almost immediately. She also carried out a quick check, and realized that she was around 8 cm dilated and that they needed to get her an epidural as quickly as possible if they were going to be able to deal with the pain in any meaningful way before the birth. Women’s College is a teaching hospital, and we were fortunate enough to have an incredible OBGYN accompanied by a rather young, and green faced intern as this was to be his first delivery…he was a tad nervous I might add! Sam was born just over 2 hours after we arrived at the hospital, with her screams echoing down the still rather empty halls. After the counting of the toes, and checking of the vitals Sam was placed in a blanket and passed onto mum to hold. As parents we all fall in love with our children, but, as with Zach it was truly love at first sight from the very first moment I laid eyes on Sam. We’d already chosen names and had agreed on Samantha as a first name, easy peasy. Like with Zach whose second name is Conolly (named after the legendary Grandfather Conolly), we decided to pay homage to my ex’s grandmother who had survived the holocaust. As with her family tradition we decided to use the first initial for her deceased grandmother (Blanca), and so named Sam (Samantha Blake) in her memory. I like to tease Sam that her initials (SB) stand for Super Bowl…the one that I missed. Lol! From the very start Sam struggled, and began to lose weight as soon as we got her home as she couldn’t hold down any milk. What was most concerning was the projectile vomit… It was clear something wasn’t right and so we took Sam to Sick Kids hospital only a couple of days after bringing her home. For any parent, the birth of a newborn is already a topsy turvy period, but not knowing why your baby isn’t thriving is nerve wracking and emotionally draining. They immediately put her into a incubator and began feeding her via intravenous. My ex’s parents stayed with Zach while we held vigil in the neonatal intensive care ward, sleeping by her crib, on the floor or in a chair if it was free, and swapping each other out to keep our sanity and connected to Zach who was full of questions. The doctors realized that Sam’s stomach still wasn’t fully formed and therefore had an infantile form of reflux – hence the projectile vomiting. Over the course of the next week they were able to stabilize her food intake and we started to see some slow weight gain, and although still not back to her birth weight yet it was definitely edging toward it. From the very onset Sam had a mind of her own, and a set of lungs to match, screaming bloody murder if she was hungry or thirsty. This was a common theme all through her early years into her teens when she learned to bake. Now she just bakes her own cookies and desserts. Lol! The care and generosity shown by the doctors and nurses at Sick Kids was incredible. I remain indebted to them for helping my sweet girl when she needed it most. 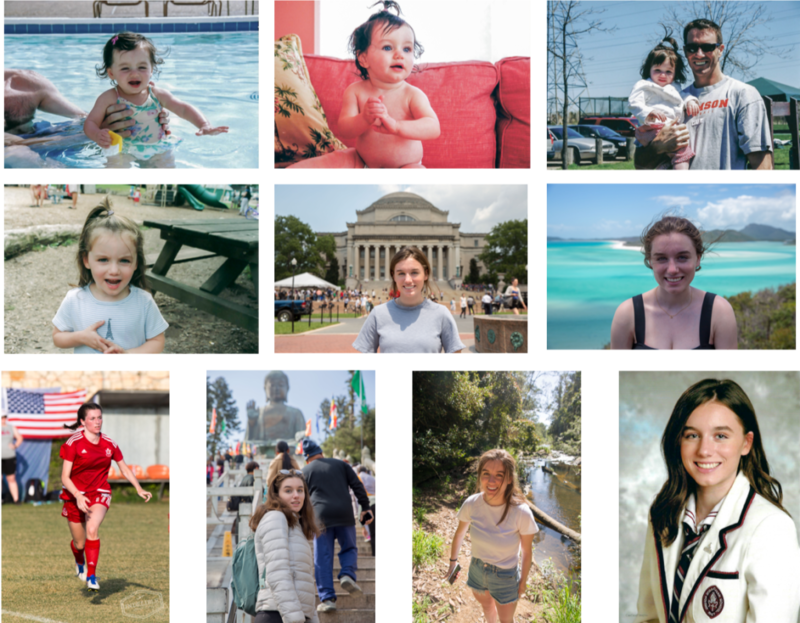 Well, as you know that was just the start to an incredible life of my brilliant and beautiful daughter who continues to astonish me with her achievements, her academic and athletic prowess, her sense of humour and more than anything her sweet and compassionate soul. I know I am very lucky, and deeply grateful for being both a dad and travel companion to Sam and Zach over the years. And although adults now I hope that they’ll still want to take the odd adventure or two with me in the years to come. Until next week when Zach turns 20. Thanks Medhat! I appreciate your note - hope you're doing well. I have treasured each post about your children and am truly grateful to have shared your family’s journey through these memories. Congratulations to Sam!